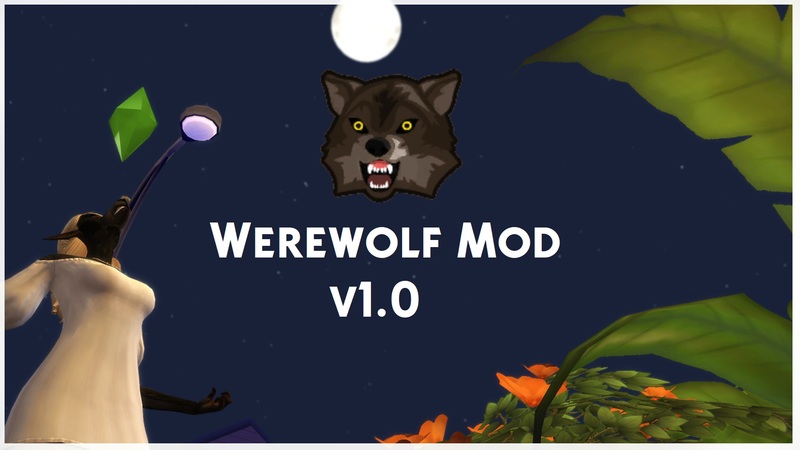 Mod The Sims - Werewolf Mod V1.1 [BROKEN] Read description! Werewolf Mod V1.1 [BROKEN] Read description! This mod is broken, When I will update it I'll remove it from here and put it on my website. - Replaced the "Ravenous" buff with the "Hungry like a wolf". This means that a werewolf, even when not in feral form, can eat spoiled food without feeling disgusted! - Added a new effect to werewolves voice other than being deep. - Now, whenever you cheat to get to level 5 of the lycanthropy skill immediately, you will have (as you should) level 4's abilities. Flavor1 makes werewolves have the "animal like" look, so with the muzzle, the fur, etc. Flavor2 makes werewolves have a "human-like" look: They'll have lots of hair, brown messy eyebrows and beard, pointed ears, sharp fangs, claws, face details and orange eyes with black sclera. - The first is given by an object from buy mode. 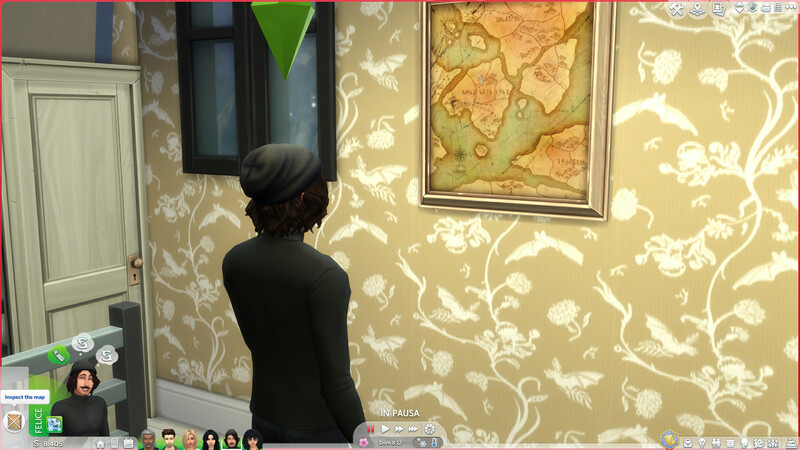 It’s called the “Special Treasure Map”, which is actually a replacement to "History of the World, Print 3" painting. 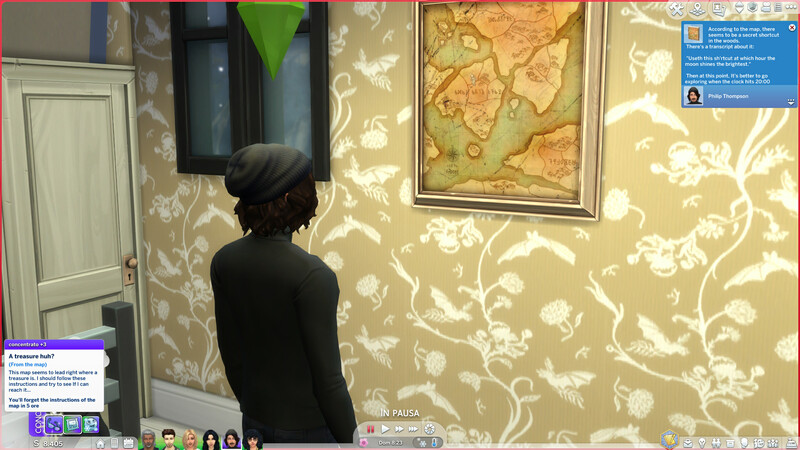 Here you need your sim to do the “Inspect the map” interaction. 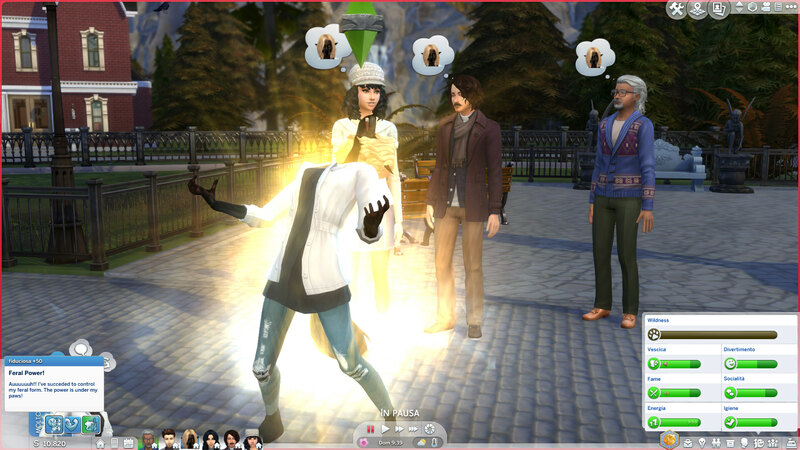 Then your sim will receive a buff called “A treasure huh?” (+3 focused) which lasts for about 4 hours. 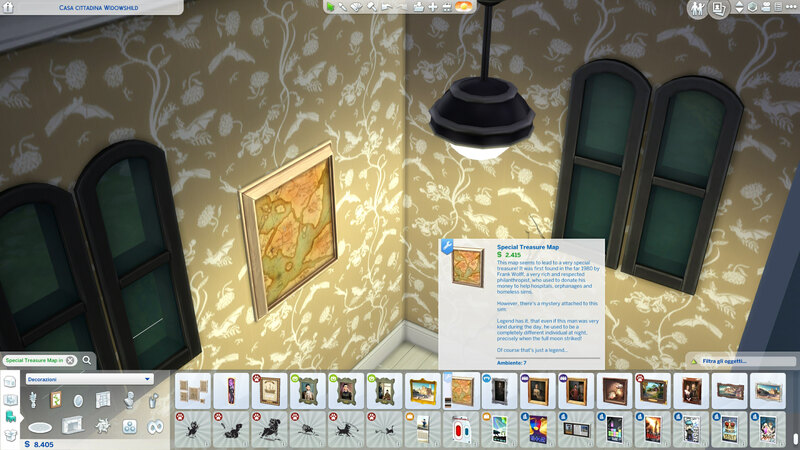 This buff allows you to perform the “Explore the deep dark woods” by clicking on your sim. 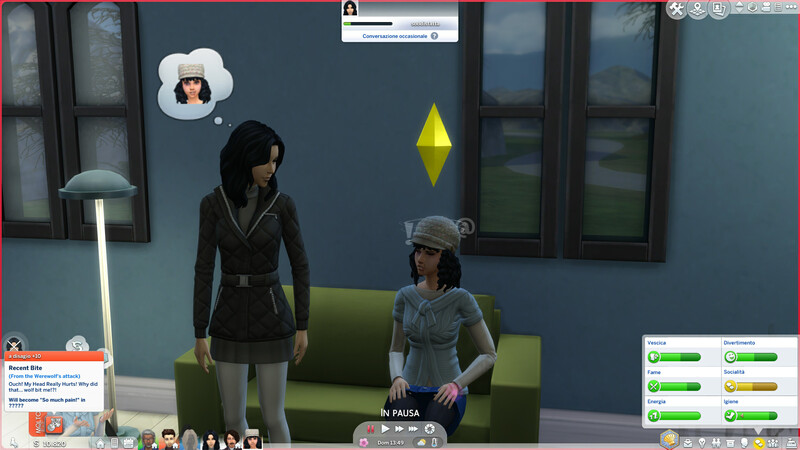 This interaction is available only from 20:00 to 5:30 while your sim has the focused buff active. 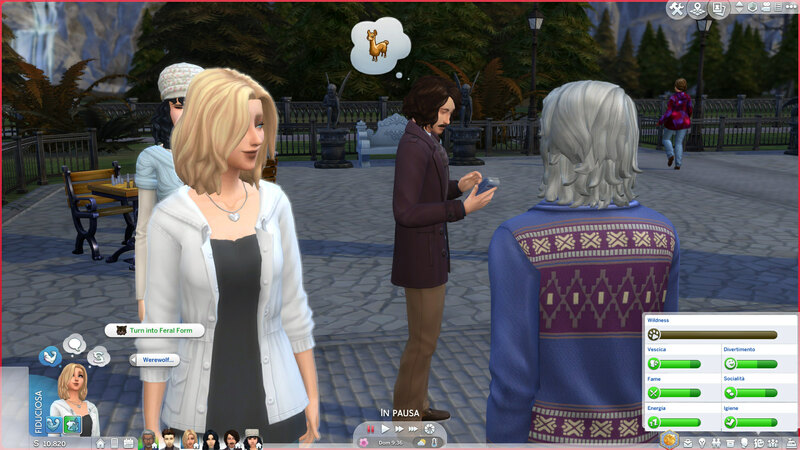 If you decide to explore, your sim will go outside your lot and have a "rabbithole" adventure. The adventure lasts 3/3 and a half hours. 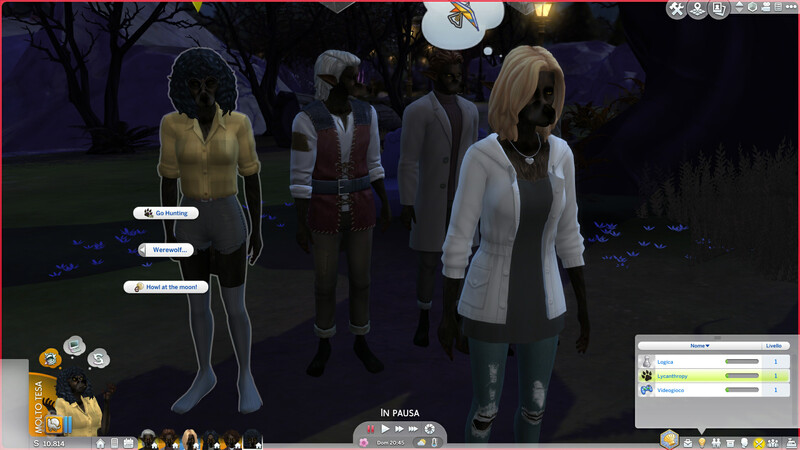 Once your sim comes back, they will have the first stage of the werewolf curse. After this "trauma" they won't follow the instructions of the map anymore and can only view it. Vampires, Skeletons and the Grim Reaper refuse to inspect the map, saying that they don't need it. - You can create a toddler/child with the werewolf trait from CAS (The animation when selecting the trait looks weird on children). When they grow up into teens their powers will be awakened and they’ll start turning into their feral form every night. The trait is available to teens too, but DON’T SELECT IT, as It will not give you any werewolf power. Note: You'll need to use the birthday cake! - You need to have a selectable werewolf sim who has reached the max of the "lycanthropy" skill. Click on the sim you want to transform, select the "Werewolf" pie menu, and click on the “give cursed bite” option. 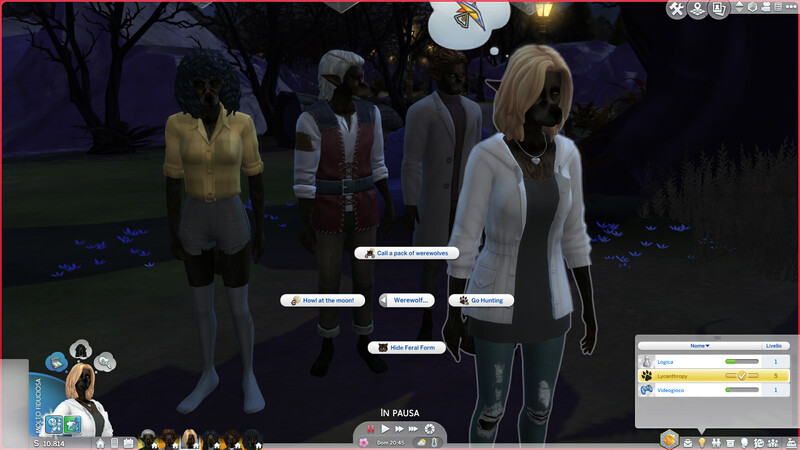 After the werewolf has attacked the targeted sim, they will pass out and after that, they will have the first stage of the curse. 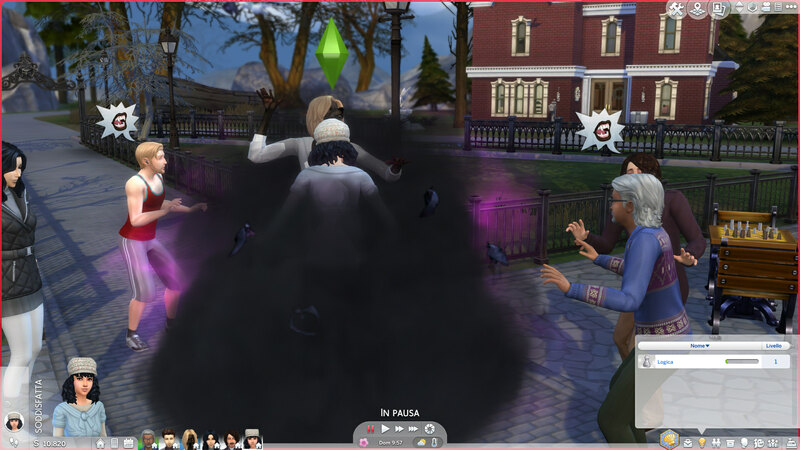 - After the "rabbithole" adventure or the attack from a werewolf, the sim will have the first stage of the curse. It will be a buff called “Recent Bite” (+10 Uncomfortable), which will give the sim some bloody scars all over their body, their left hand bitten, and an occasional idle animation where the bitten hand will "pulse". The buff lasts for about 6 hours. - After the first buff expires another buff will spawn. It's called “So much pain!” (+20 Uncomfortable), which will give the sim a "cleaned" version of the scars, and the same idle animation as the first stage. The buff lasts for about 4 hours. - The third stage will be another buff called “Temporary Amnesia...” (+30 Dazed), which will give the sim a more healed and transparent version of the scars (but the bite is still noticeable) and a different idle animation. The buff lasts 3 hours. - The fourth and final stage will be a buff called “Ferocious Behaviour” (+1 Embarrassed), which will remove all of the scars from the body (except the bite) and will give the sim another occasional idle animation. It lasts 3 hours. After these stages you’ll need to wait 20:00 (18:00 in Forgotten Hollow) for your sim to turn into a werewolf. - They’ll have a muzzle. - They’ll be more muscular. - They’ll have a deeper voice. At 7:00 the werewolf will turn back to normal. - Hunt for food, which will make them disappear from the lot for about 3/4 hours. Once they've returned, they'll have 2 raw foods on the inventory. THIS INTERACTION IS NOT CANCELABLE SO USE IT ONLY IF YOU WANT TO. - Howl at night (from 20:00). 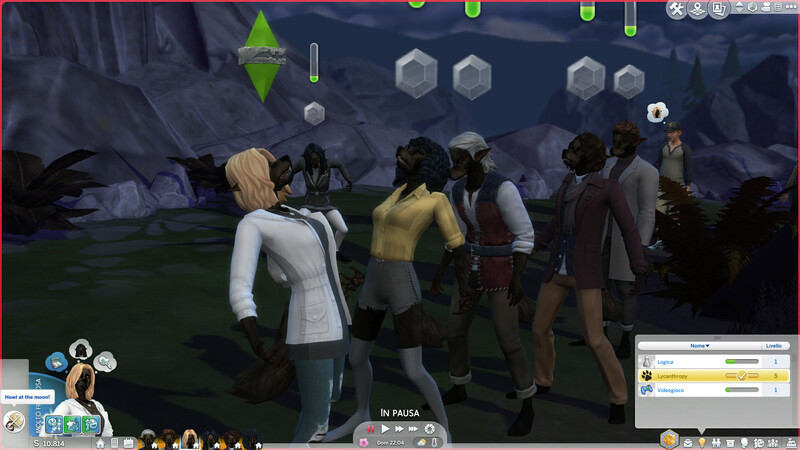 This interaction will make other sims react: Werewolves will howl too and other sims will be surprised by the werewolf. - Growl at other sims. 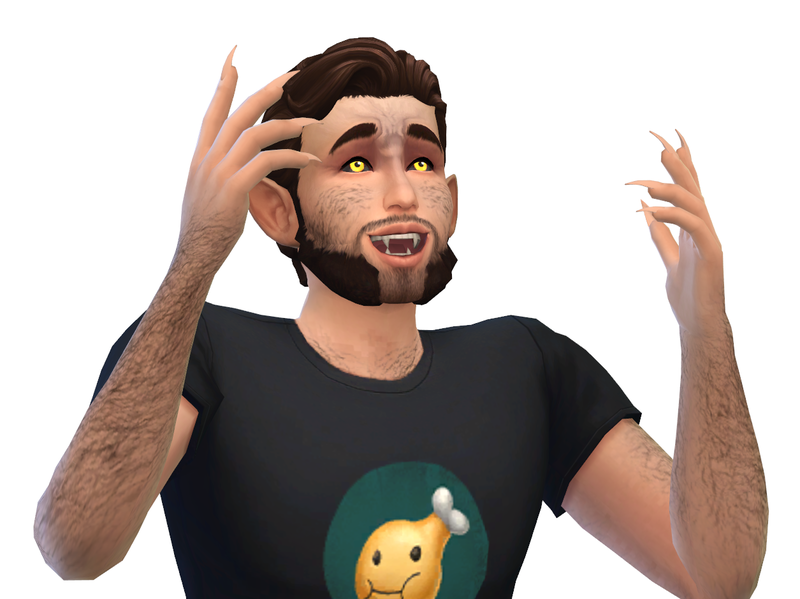 The reaction will vary depending on the targeted sim’s occult: If it's a vampire they will yawn, If it's a sim they will be horrified, and If it's a werewolf they will respond ferociously. - Maul human sims, where they will just attack the target, making them pass out and receive the "Attacked by Werewolf" (+4 dazed) buff. - Make a special howl exclusively to bring some other werewolves on the lot. - Practice sparring with other werewolves (In their feral form) independently from the target's lycanthropy level. - Be free from the classic transformation cycle, and will no longer be influenced by the full moon that much. In fact, they’ll have a new need corresponding to that: The Wildness need. This need will drop if the sim is in their human form, and will raise if they are in their feral form. To change into their feral forms, they’ll have a new option in the “werewolf” menu called “Turn into Feral Form”. If the need drops too low, they automatically turn into their wild form, and they'll have to wait 6 hours in order to turn back to their human form. The need drops faster when it’s night. - Have mastered their feral powers so the wildness skill doesn't drop anymore. - They can either order a cure on the phone. To do this you have to click on your werewolf and select the “Order a Lycanthropic-B” interaction. A thing that can be done by any level werewolf is the romantic "Nuzzle" interaction (still in beta phase, because it still has some bugs) which can be performed by two werewolves with eachother. After a level 5 werewolf drinks the cure their lycanthropy skill will be completely erased and their body will be weaker. Now here comes the third method quoted before***. A cured werewolf will have the number of the provider of the cure which doesn't just make the cure itself, but also makes "antidotes" for it. To order a cursed drink you have to click on your sim and select the “Order a Lycanthronic-A” interaction. After that they'll have the cursed drink in their inventory and it's you to decide whether it's the ex-werewolf to drink it or another sim. Just remember that an ex-werewolf will have to reach level 5 of the lycanthropy skill again in order to drink another cure, so be wise! If a human or a low-level werewolf drinks the cure they will receive the nausea buff. 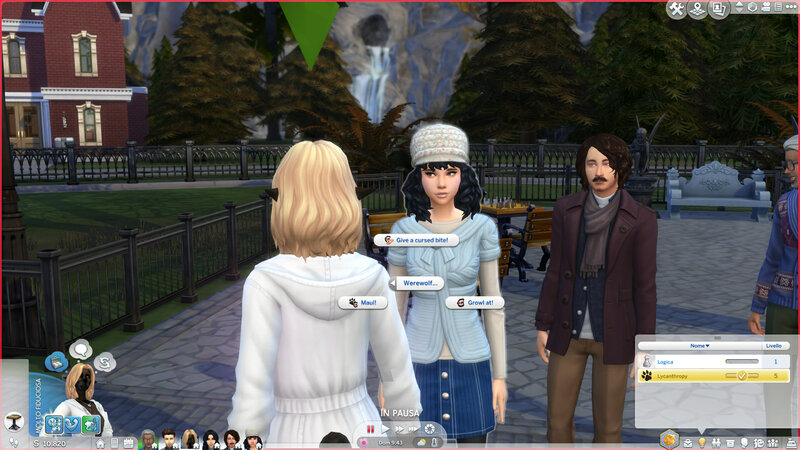 - Some sounds, like the werewolf growling at another sim, requires vampires to be heard. In the future I'll put custom sounds to that too. - The muzzle appears strange when given to a fat sim. - The “Nuzzle” Interaction, will appear strange. So, to make it appear good, you will need to perform a romantic interaction first, like a “kiss on the cheek” or “Hold tightly” etc. It also doesn't have any relationship filter so it can be performed even by two werewolves that hate eachother. - As for now all the social interactions werewolves don't have any relationship consequence and will REQUIRE the two sims to stand up! If they sit they will NOT perform any animation and it will give the direct consequence to the target. - The werewolf cure/cursed drink will need to be drunk while sitting on a chair (with a table) or on a stool (with a bar). If the lot doesn't have any of these things, the potions will not be drunk! - The “Go hunting” and the "Explore the deep dark woods" interaction are available even in the social pie menu. 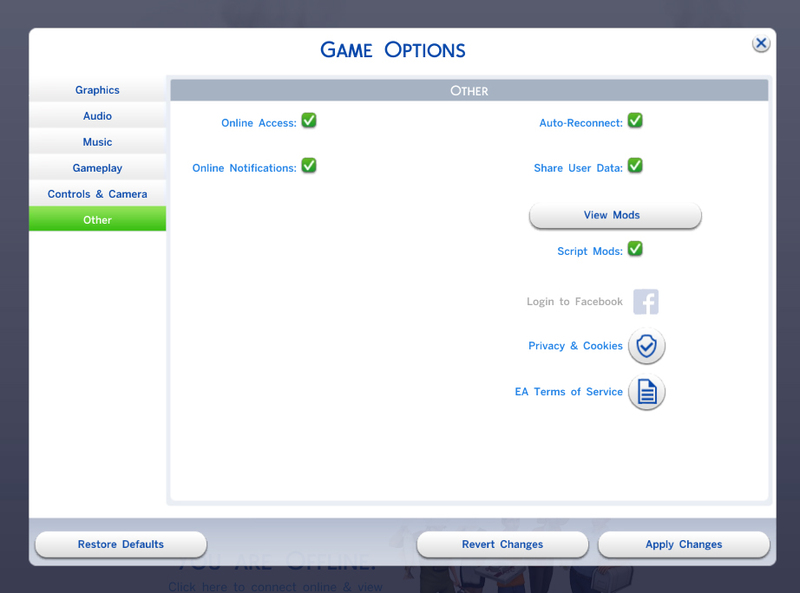 So it might be possible to see them when clicking on other sims. So don't click on them! Thanks for taking the time to read this, enjoy the mod! - Mystic Modder, to have helped me with the social interactions. 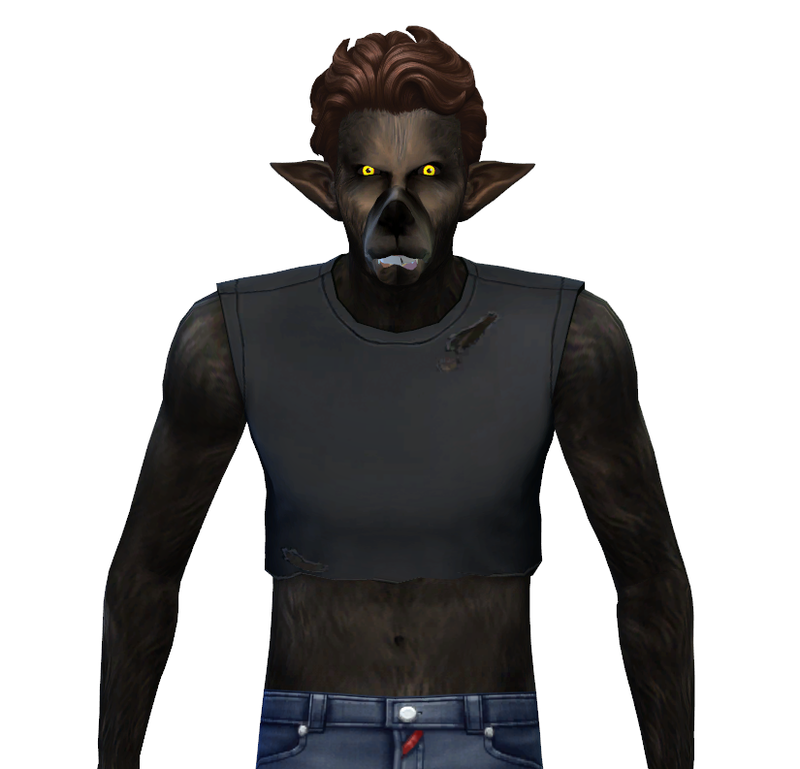 - Merman Simmer for the original werewolf skin. - NotEgain for the werewolf ears. - Notanotheranimesimblr for the tail conversion from YS used to make the werewolf tail. - Icemunmun for the raw food given to werewolves when hunting. - Thepancake, for his help with animation conversions.